A couple of weeks ago, my first cousin invited Mrs. MM and I to her 59th birthday, celebrated with a Sunday lunch with lugaw or rice porridge, presented with 59 different toppings. Unfortunately, we were in Cebu for the Sinulog celebrations so we weren’t able to attend. And now that I think about it, I wasn’t able to ask her if she had lechon flakes as one of her 59 different options. Apparently, guests brought another 4 toppings that they thought they just HAD to add to the selection so there were 63 toppings total! With all the holiday eating, and our daughter back from the Northern hemisphere and totally different diet of potatoes and institutional food, she inevitably succumbed to overeating and its plumbing consequences, so we had lugaw one night during the Christmas holidays… and our only option for a naughty topping (only for Mrs. MM and myself) was some deep fried lechon flakes, chopped green onions, and some kalamansi and soy sauce. Yum. 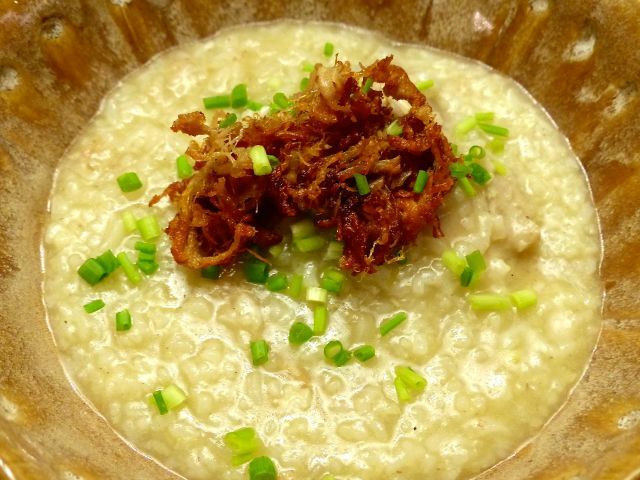 It’s 1 am here and that picture is so tempting I want lugaw right now. It’s torture! Not a bad idea, looks scrumptious! MM…next time, make your lugao with all short grain or sushi rice. It will give you that nice thick consistency that won’t get watery at all. I don’t use the long grain rice mixed with malagkit anymore. NO longer do I have in the pantry so many kinds of rice…sushi rice and jasmine Thai rice only. Sushi rice for kimchi fried rice and lugao or congee. Ms Betty, you are right. I found this by accident. Actually, I had some left over already cooked sushi rice and home made chicken broth. I made arroz caldo with it, with the chicken hinimay deep fried with tofu and slivers of garlic. Also added mirin n fresh purple onions. Yummy. Way on top of my comfort food lists. Ebba…do you make Hainanese chicken? If you do, make a balde of the poaching liquid or each time you make Hainanese chicken freeze the poaching liquid or whatever you have left after you use the poaching liquid to make the flavoured rice. Then when you have enough, you can make lugao any time or hour of the day….yes, CWID even at 1 am! Throw everything in a slow cooker and when you wake up at 8 am, you have lugao ready! I find that the Hainanese poaching liquid has just the right gingery/onion flavour and need not sauté any thng else to make the porridge. Even better…make a lot of the Hainanese flavoured rice, freeze the leftovers, use those with the poachng liquid and you will have the best tasting AROOZ CALDO EVER! Thank you, MM! Perfect inspiration for dinner tonight! It’s still nippy today and my boys always love good ol’ lugaw/congee. I actually also have lugaw/congee dinners for family and friends every so often. But I have yet to present more than ten toppings in the spread. Hhhhmmmm, now I am challenged to make it at least 12. Wouldn’t be too hard to do here in congee-crazy HK. Ms Betty, nope I have not tried your recipe yet, but will soon. I will then follow your advise. Thanks as always, you give great tips. Lugaw with chicken feet and fresh chives = favorite! I’d crisp up some Zubusisig then top my lugaw with that! Buti na lang lunchtime na! I remember going at a congee buffet in Suntec Singapore before, they had different kinds of congee and a variety of side dishes and toppings to go with it. . . I also do it once in a while at home, cooking congee and a number of side dishes and toppings for a weekend brunch, it is something different, everyone likes it . . .
Now I have to look up bettyq’s Hainanese chicken recipe! Love pospas. Wow! I know of only 6 toppings off hand. Poor me.